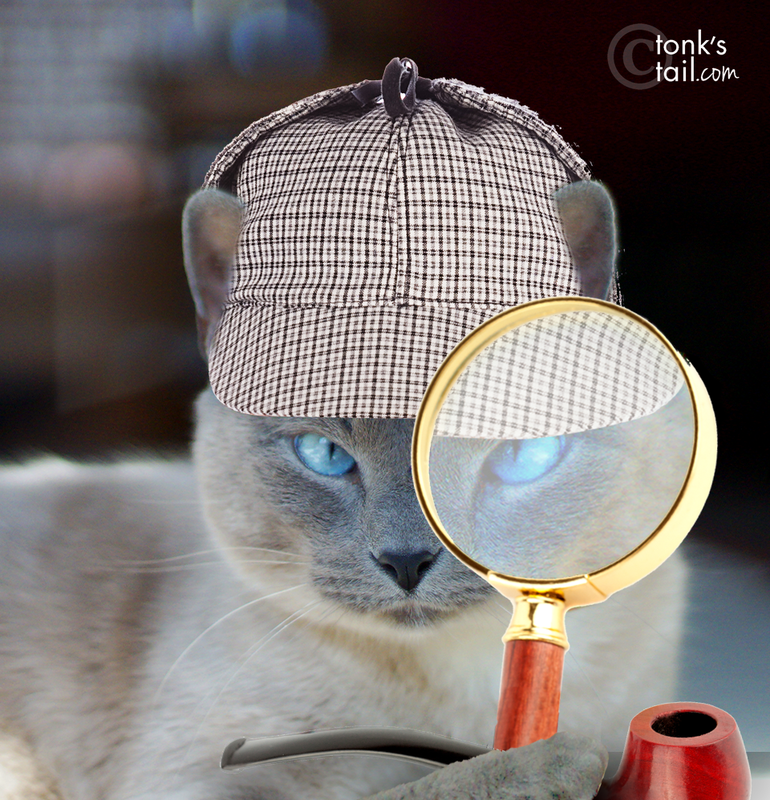 Our Siamese Sherlock is at it again, and this time, he's gathering evidence on the Maven of Mayhem herself, Miss Kitty Klaws. Wait for it, gentle readers. Faraday: Hey Maxie, wanna go count squirrels in the front window? Maxwell: Don't bother me, boy. I'm working here. Maxwell: Yup. Momma caught Allie red-pawed, scratching their brand new sofa (the one that took Papa elebenty billion years to decide to buy, but I digress). Faraday: *skeptical look* And you think you can solve the problem of her scratching? Have you seen those claws she has? I think Mommy's gonna hafta kiss that new sofa smell goodbye. Maxwell: Dood, what's the smell have to do with her shredding the new sofa? "I'll scratch where I want to, thank you very much." This is actually a serious problem in our home, and Marty's none too happy when he catches Allie scratching up the only sofa in a four-state area that he likes (and spent way too much $ on, but like Maxie, I digress). 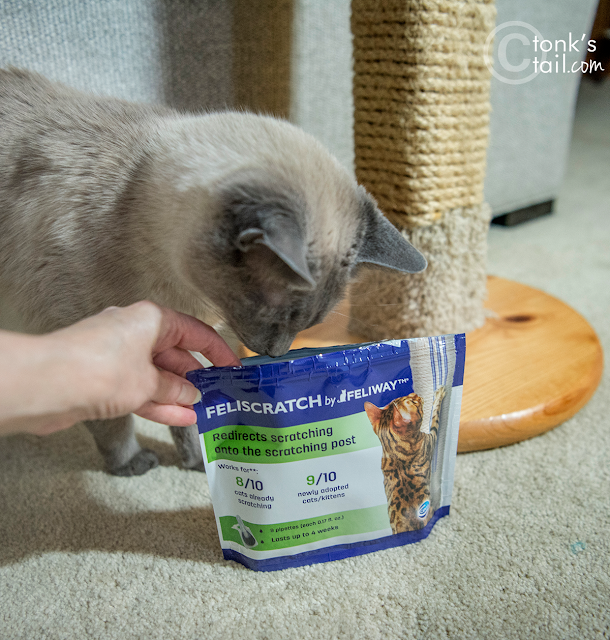 So when the folks at FELIWAY® told me about FELISCRATCH by FELIWAY® I got pretty excited, and couldn't wait to see if it would work with Allie. "Looks like you and I are going to go a few rounds, FELISCRATCH...."
Cats are territorial by nature. They like to feel in control of their territory and have their own way of telling other cats “this is mine”! So they scratch in visible places, leaving marks and “territory messages” that come from the pads of their feet. FELISCRATCH by FELIWAY® encourages cats like Allie to scratch where its own "territory messages" have been applied. These messages transmit an encouraging "scratch here" message. See for yourselves dear readers! 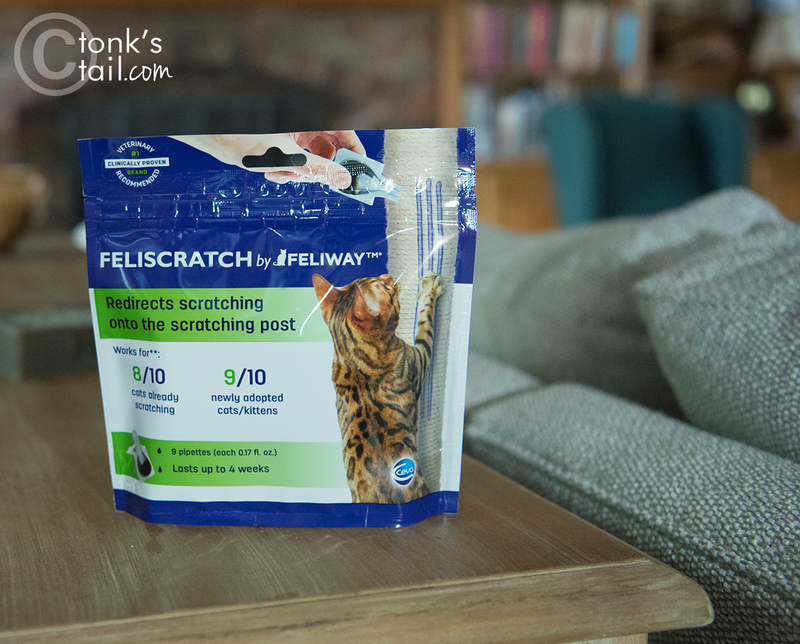 FELIWAY® recommends a full 4 week protocol, which consists of once-daily application for 7 days, to help reinforce the message to the cat and modify their scratching habits, followed by the application of 1 pipette at the beginning of week 3, and another at the beginning of week 4. Maxwell: As you can see, FELISCRATCH by FELIWAY® successfully turned the Maven of Mayhem back into Daddy's Favorite Girl. Faraday: *gagging noises* Seriouslies, Maxie, you just ruined my appetite. And that's saying something. In all seriousness, we do love the fact that the product was so effective. I also love that it's non-sedating and will not interfere with any other medical treatments or conditions. And studies conducted by FELIWAY® show that it's clinically proven to effectively redirect unwanted scratching in the home, on both horizontal and vertical surfaces. 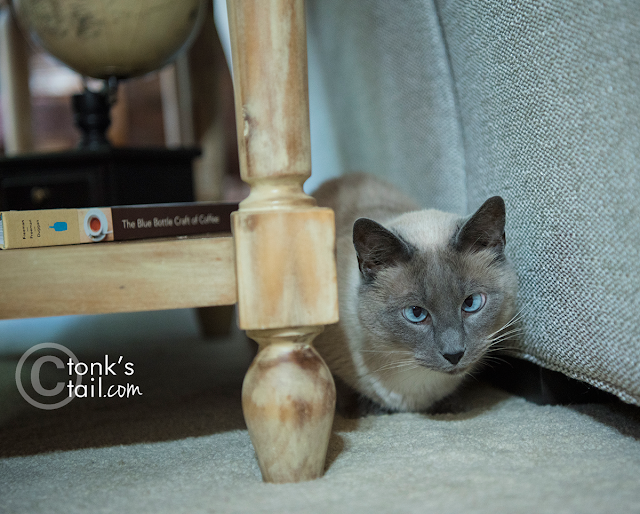 Yes, Miss Kitty Klaws is now a reformed felon, thanks to FELISCRATCH by FELIWAY®. 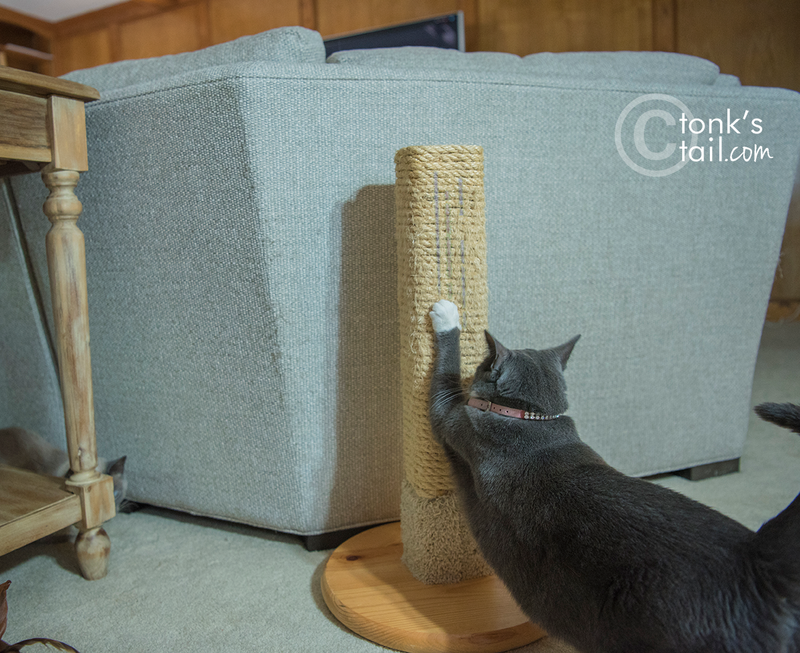 Have you ever had issues with inappropriate cat scratching? 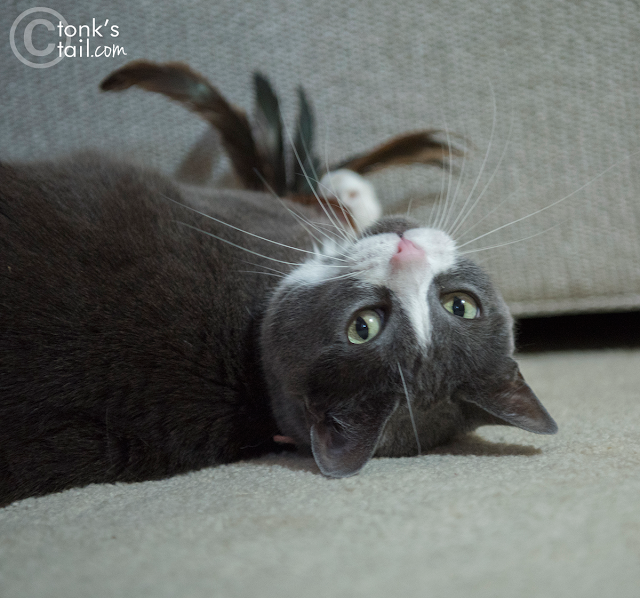 Given how often this problem contributes to the practice of declawing—and in many instances, the relinquishing of companion animals for rehoming in shelters—we honestly see this product as something that can have a positive impact on the number of less adoptable cats in shelters. And that, alone, would be enough for us to give it our 5-PAW Rating. YAY Feliway!!! Love, love, love this post and Maxwell Holmes SO much! 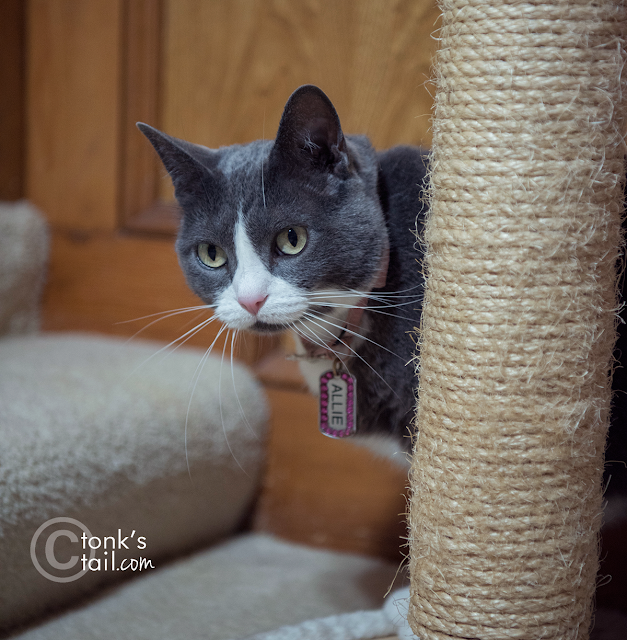 We’re so glad that feliway worked because we wouldn’t want Allie to be in the doghouse. Glad it worked. You look so cute as Sherlock Holmes. We can't believe you'd ever do anything like they say, Allie! How cool that it was so effective! Nicely done, Allie!!! We know so many cats (and couches) this has helped! But the best part of all is how many paws and lives it can potentially save. How could anyone ever accuse you of anything, Allie. We are sure that the evidence was planted using a lookalike! Good sleuthing Maxwell. Hopefully the new scratcher keeps Allie away from the couch. Double-sided sticky tape kept me from scratching dad's stereo speakers. I have plenty of scratchers in the house, I just enjoyed the texture of the speakers. Glad that worked so well! Pipo's fave scratching place are the book bindings on the lower bookshelves. Weird, eh? MOL! There are plenty of more appropriate scratching places by each of those areas...Hmmm, maybe we need a look at this product. I think you may be on to something there! On occasion I get the urge to scratch on Mom's settee to get her attention, but she quickly gives me "the look" as my claws attach to it, and I loose interest. 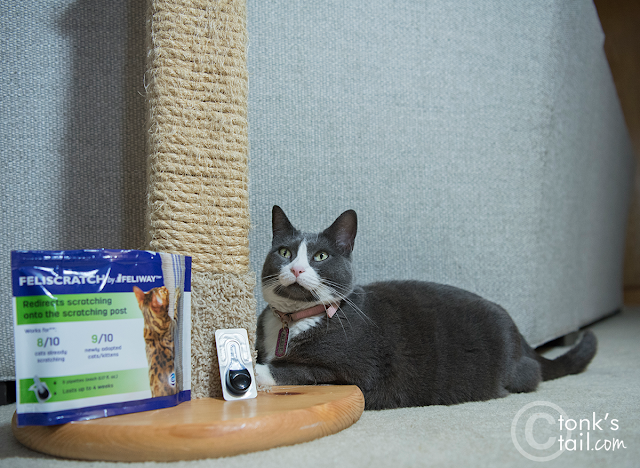 Moms asks if you notice that the Feliway has a fragrance that might bother humans or pussycats with allergies or sensitive lungs? Tummy tickles. Where did you get that scratcher? Where did you get that awesome scratcher?